Dan Chisena scored the longest touchdown if you don’t count the halftime scamper by Carolyn Kieger. The Blue-White game went as planned on Saturday. Young players got to see the field for the first time and veterans got their work in as well. There were many former players in attendance. The weather was great. C.J. Thorpe showed what he can do from his right guard spot. After moving to the defensive line as a freshman, Thorpe is back on offense and ready to pave the way for tough yardage up the middle. On the first touchdown of the day, Thorpe (69) blocked redshirt freshman Judge Culpepper (88) at the point of attack. Matt Millen, back in the press box following a heart transplant just a few months ago, called the play right before it happened. Millen did refer to Thorpe as Ian, rather than his actual name of Christopher Neal Thorpe Jr., or C.J. as we know and love him. We’ll give Millen a break since he’s one of the best in the booth and we are all glad to have him back. 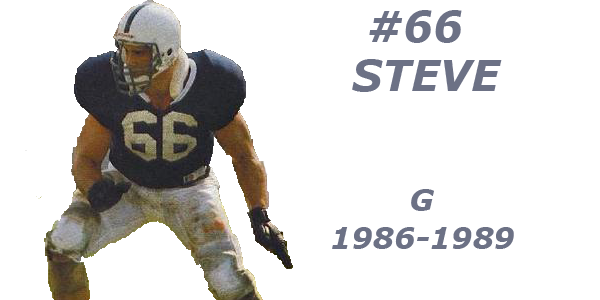 Culpepper was one of the young players that got early time on the field, showing off both his big body and speed. He’s not C.J. Thorpe -ready, with Will Fries coming on the double-team, but he should make an impact this year. Fries (71) finished the play, taking the young defensive lineman nearly to the back of the end zone. 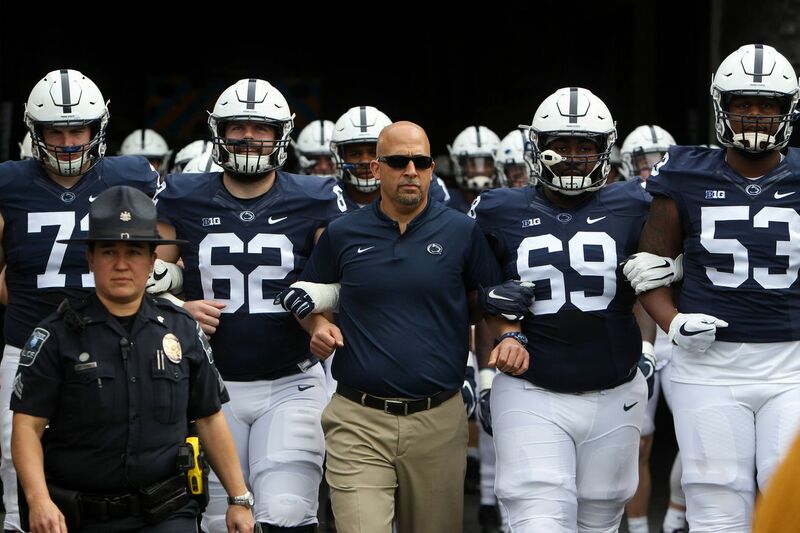 It was a good look at what the power run game may look like for Penn State in the fall. On the opposite side of the line, redshirt freshman Rasheed Walker took snaps with the starters as was expected. Like Thorpe, Walker has a lot to learn and very little experience, but each player has the talent and body to compete in the Big Ten. In the backfield, Noah Cain got a lot of attention. The incoming freshman carried the ball frequently, switching from the white side to blue later in the game. Cain (21) showed his shifty abilities in the fourth quarter when he took a simple pass from Sean Clifford and then made fellow freshman Brandon Smith (12) miss in the open field. Smith didn’t look very good on the play, but the young linebacker showed that he has the body and instincts to play early in his career. Smith played a lot on Saturday and it will be a great learning experience for he and the other young players that got their first taste of the atmosphere inside Beaver Stadium. Newly hired women’s basketball coach Carolyn Kieger made what could be considered the play of the day. A couple of years ago coach James Franklin invited the media to field punt returns during halftime of the Blue-White game. It did not go well for the press, as all but a couple of footballs fell to the turf. Well, coach Kieger proved that she is quite an athlete, all joking aside, with the ease that she showed getting her feet to the spot where the ball would eventually come down. The run to finish the play was for show, but the catch was valid. It looks like Sandy Barbour picked a winner, although coach Franklin did throw a flag after the touchdown for excessive celebration. Micah Parsons started alongside Jan Johnson and Cam Brown at linebacker. There is plenty of time between now and the start of the season and the trio looked great out there together. Ellis Brooks seems ready to step into the lead supporting role. Lamont Wade was at safety opposite Garrett Taylor. Wade played fast and looks like he is ready to make the next step, from key substitute to starter, this fall. Jonathan Sutherland may have something to say about that, as he looks ready to contend for the starting spot as well. The unit will be strong and competition is healthy. On the defensive line there were several players that appeared to have taken leaps forward since we last saw them. Jason Oweh is one. At 6-foot-5 and 250 pounds, the young defensive end looked like a blitzing safety at times when he got into the backfield. His athleticism and speed are unique for such a big man. He should be ready to be in the rotation soon at defensive end. Defensive tackle Damion Barber appears to be poised to break into the rotation as well. With Antonio Shelton returning from injury, and Robert Windsor back, Barber will join PJ Mustipher and Fred Hansard as key players on the inside. No major injuries were reported after the game and it did not appear that any player sustained anything other than some scrapes and bruises, the normal wear and tear. Will Levis found Dan Chisena for a long touchdown pass down the sideline. Chisena showed his track wheels while getting behind the defense. The touchdown is at the one-minute mark of the highlights of the game provided by the Big Ten Network.